Girls Varsity Tennis Wins Its First CIF Championship! 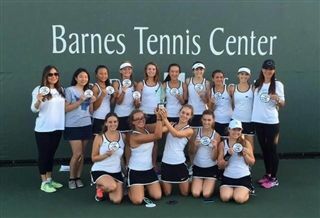 On October 30th, the Pacific Ridge Girls Varsity Tennis Team won its first California Interscholastic Federation (CIF) Championship! The fourth-seeded Firebirds captured the Division II title with a 15-3 win over No. 3 Patrick Henry at the Barnes Tennis Center in Point Loma on Friday. Throughout the week, Pacific Ridge advanced through the playoffs with victories against Monte Vista (#13), Eastlake (#5) and San Marcos (#8). The championship win is an exclamation point on a perfect division record, as well as a fitting redemption for last year's double tiebreaker loss in the Division III finals. Congratulations to the players and coaches on an amazing season, an incredible playoff run, and a history-making championship!